Remember this? 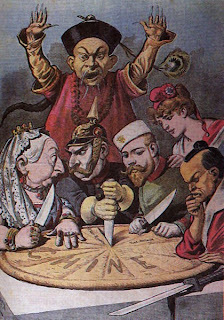 It's a French political cartoon which appeared during the 1890s. Aaah, the good old days!! But seriously...I can't wait until the London 2012 Olympics. The sudden new wave of libertarians and human rights advocates has left me holding my breath, eager for more. It's just that I'm terribly ignorant and I need a refresher course on global humanity, or lack of it.